You’d hope he’d want Liverpool and his former team-mates to beat Real Madrid in the Champions League Final, which would actually secure him a winner’s medal, having personally done so well in the competition for us before Christmas. 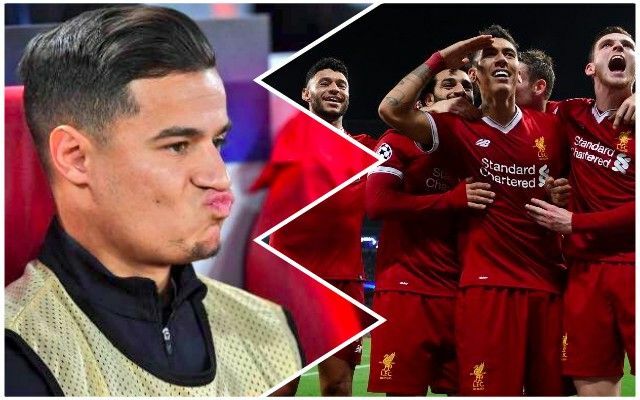 But there must be a part of him which wants to avoid the embarrassment of leaving Liverpool to win the Champions League, only to see us do it without him. Something very similar happened with Michael Owen back in 2004, actually. Liverpool coach Peter Krawietz has discussed the Brazilian’s exit and how in the end, the club and most interestingly, the players, thought it sensible – so as to rid the group of a negative entity. “His change was very painful, because we lost his quality and special style of play,” Krawietz told SPOX. “So we had to ask ourselves: Can the group deal with this? Can we respond to this urgent call to change? “In the end we answered in the affirmative. Phil was a formative figure with us. It was a pity he left. Fortunately, we have managed to absorb his loss collectively. “Of course, one notices whether a player is happy or unhappy. “When a club approaches a player and suggests things to him, such as he might force a situation that complicates the situation for his current employer, that’s not nice and distressing for everyone. Coutinho is a special player, and having found his feet, he’s been tearing it up for Barcelona in La Liga. The Brazilian is worth the £142m, and not for one minute are we going to claim otherwise. But the fact we’ve coped so well without him is testament to Jurgen Klopp and his squad. Who’d have thought the likes of James Milner, Jordan Henderson and Gini Wijnaldum would step up so heroically in midfield to fire us to the Champions League Final? Not many, but they have. And it’s these players who have a chance of confirming their legendary status in two days’ time – not Phil.